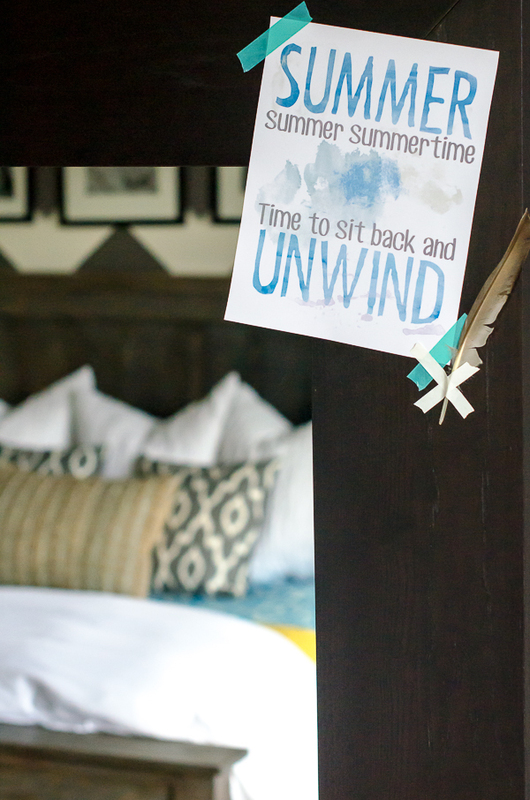 I am so thrilled to be joining my friend Gina from Shabby Creek Cottage on a summer tour of bloggers’ homes! Because this is a blog hop, some of you may be visiting here for the first time from Madigan Made. Welcome! If you’ve spent any time reading this blog, you may know that I live in perpetual summer. 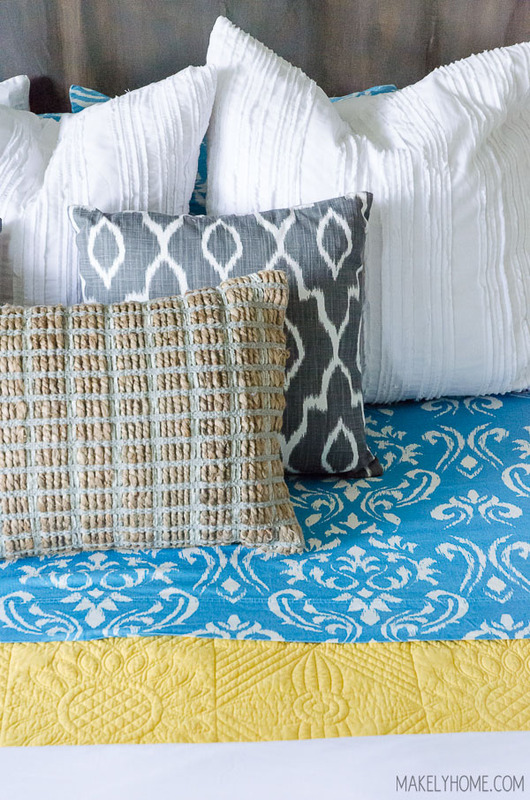 I love bold, over saturated colors, and my decorating style reflects that obsession. The only time I really ever tone it down is during Christmas, but let’s be honest – I do Christmas in a bold, crazy way, too. So, Summer decorating is really no different than the 11 other months out of the year at my house. Since I showed most of my home in last year’s tour (except for this room and this room that I’ve since finished), I decided to show you some things I’ve changed up since then. Sound good? Awesome. 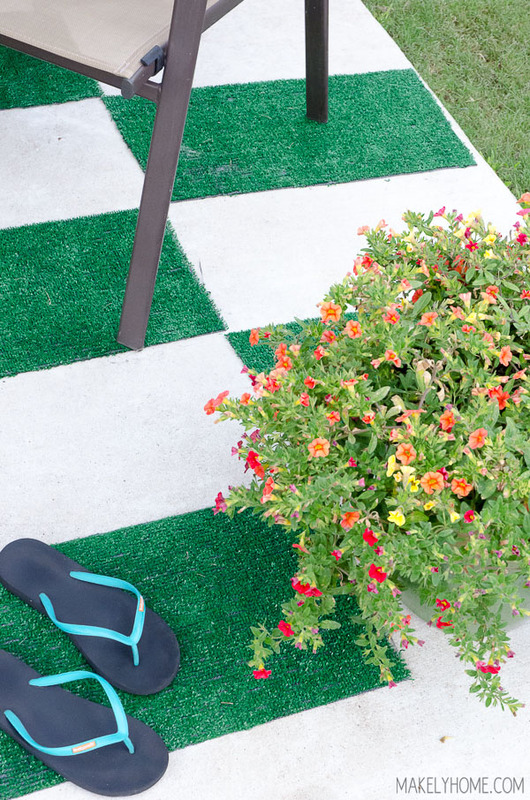 I cut up an Astroturf rug again, and this time I installed it on my patio. I am so freaking excited with the way it turned out! Here’s the tutorial for how to make one on your own. It was so easy and adds a lot of quirky charm. 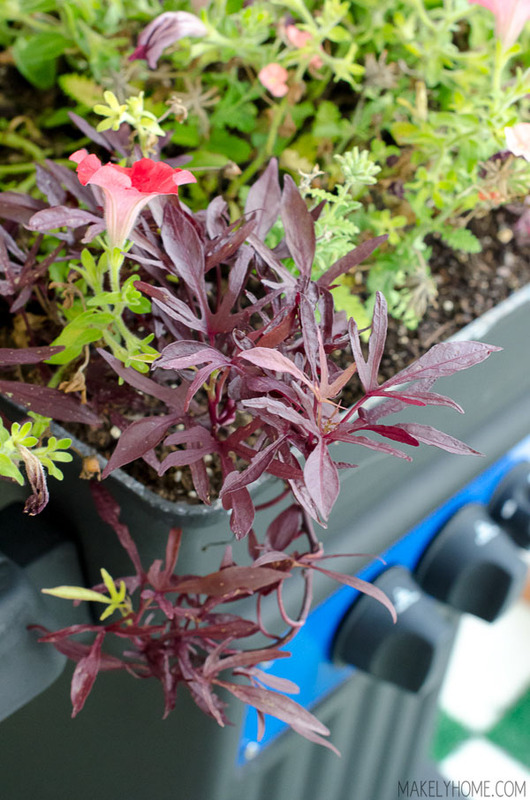 I moved my BBQ grill turned planter onto the porch and added some colorful flowers. I’ll probably kill them in about a month, but I’ll try really hard not to. 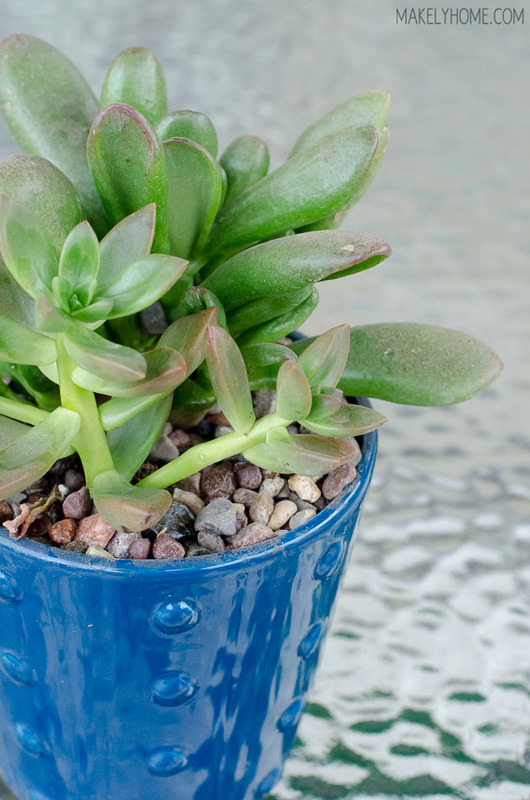 I picked up this cute little planted succulent at Lowe’s, too. I really liked the little pot. That’s probably the only part that will survive my black thumb. On the blank wall, I hung this etched mirror I made a few years ago. My son, Zack, may be five years older, but he still has that exact same profile. I love how it reflects the flowers. This mirror has been shoved in a closet for a few years, so it’s fun to put it to use again. 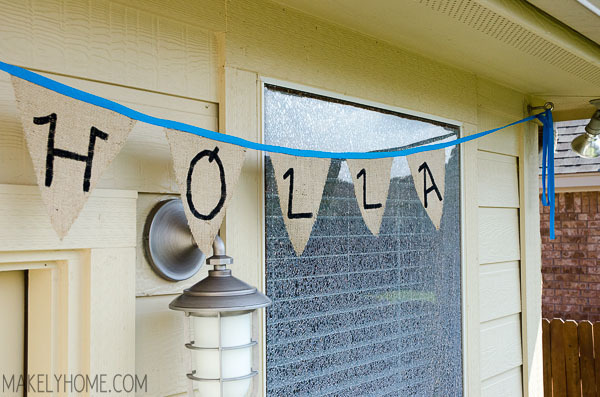 Above the BBQ planter and broken window, I hung a burlap bunting that I made. Zack, who is a fluent Spanish speaker, pointed out to me that I misspelled “Hola.” Jokes on him, because I meant for it to say “Holla!” I don’t know why. I just wanted it to say that. Alright, let’s go back inside because it’s hotter than the surface of the sun out here in Texas. My dining room and entry way have some fun summer color. I love this plaster planter that I picked up a few years ago at Round Top. 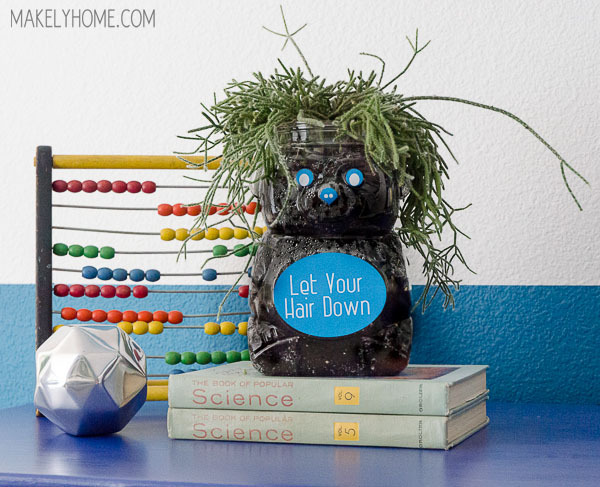 I made a crazy little planter for my kids’ playroom. Don’t you love those animal cracker bear jars? I’ve been threatening to turn it into something fun, and I finally did it. I’ll have a tutorial on this soon! Our master bedroom got a little update, as well. I found more discount bedding (Tuesday Morning, Marshall’s and Amazon this time) and freshened up our bed. 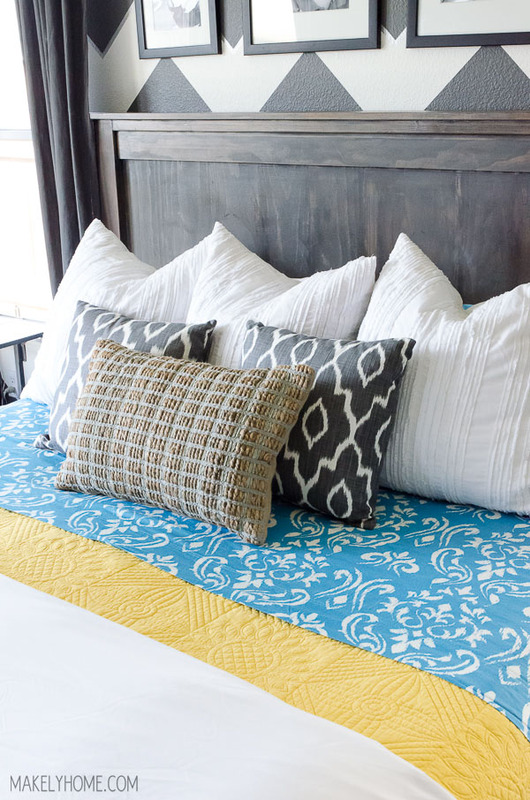 I was so excited to find those sheets – it’s really hard to find quality king sized pattern sheets for a good price. My chalkware dog got an update, too. Now, he’s got on some shades. Okay, so they are 3D glasses from some kids’ movie, but we’re going to pretend they are sunglasses. 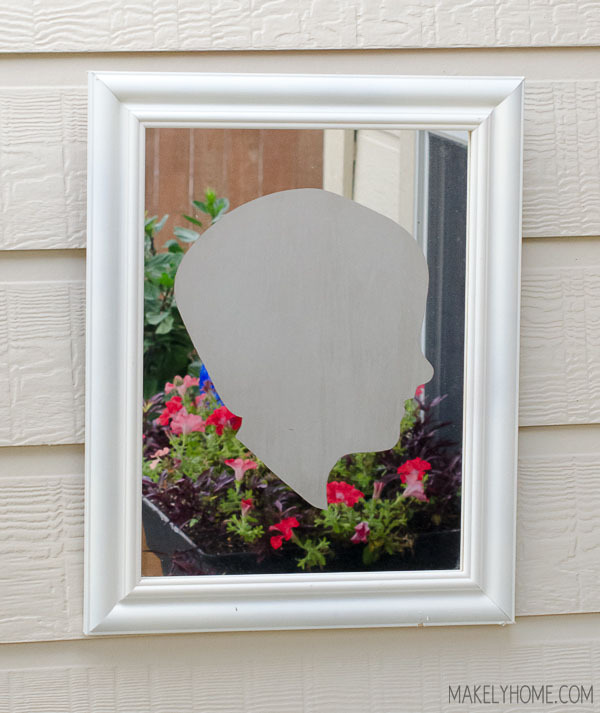 I also made a little printable to hang on our floor mirror. Yes, that song will now be stuck in your head all day. You’re welcome, because it’s awesome. Here’s where you can download it for free to use in your own home. Okay, that’s just about it! I hope you enjoyed my summer home tour. Now, head over to my friend Donna at Funky Junk Interiors. I’m certain her tour is going to blow you away. Love your home and your style. 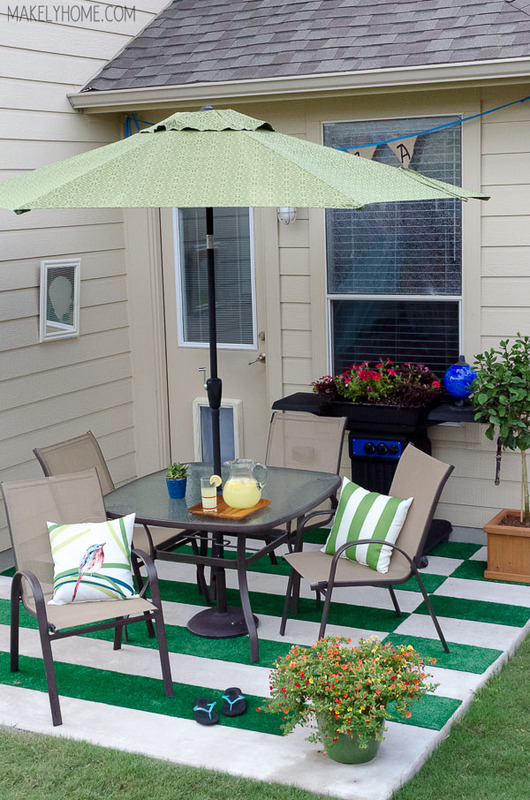 The patio is fabulous and that rug is amazing. I adore your bedroom, it is one of my favorites. Beautiful tour. 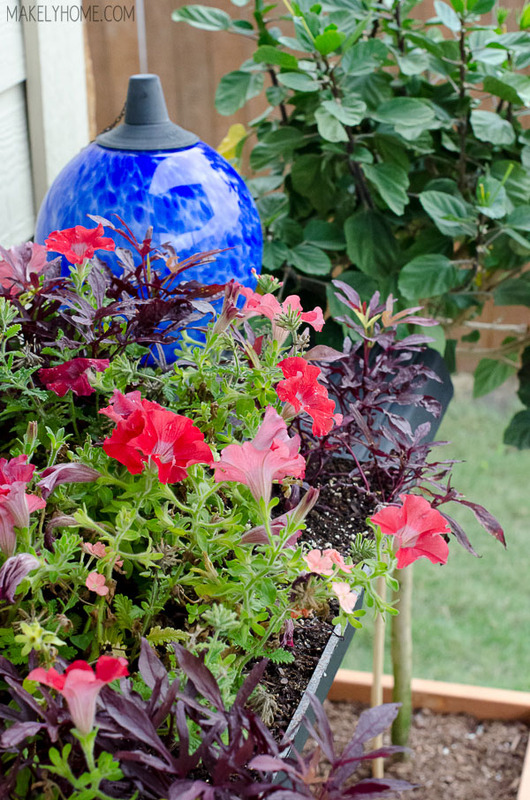 I love all of the color and fun in your home!!! And I am coming over to hang out on your back deck! Oh girl. 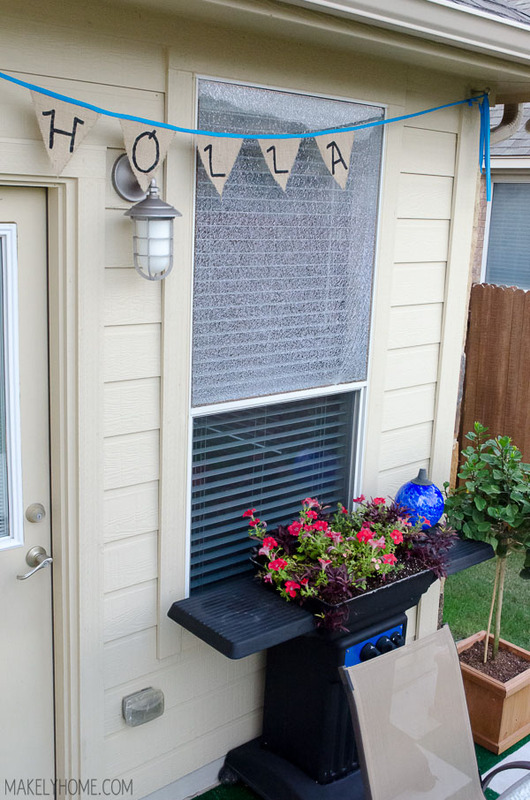 Your special signature totally shines in your rockin’ home tour! The astro turf patio is so cool! And you know I’m all over that picture frame wall. 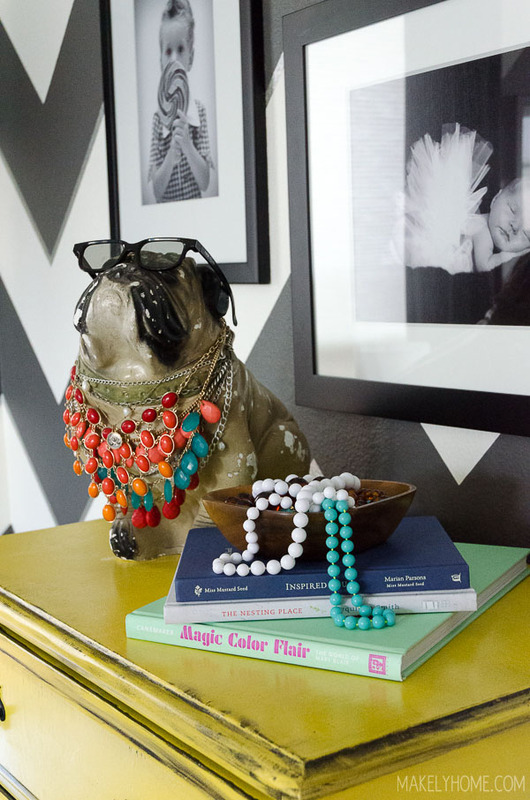 And then there’s the bulldog jewelry holder… your home just makes me feel happy! Can’t wait for the tutorial on the turf outside! 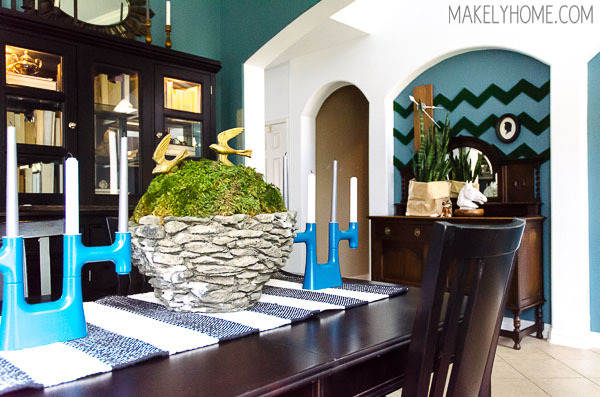 and love that centerpiece on your dining room table with the birds!! fun tour! 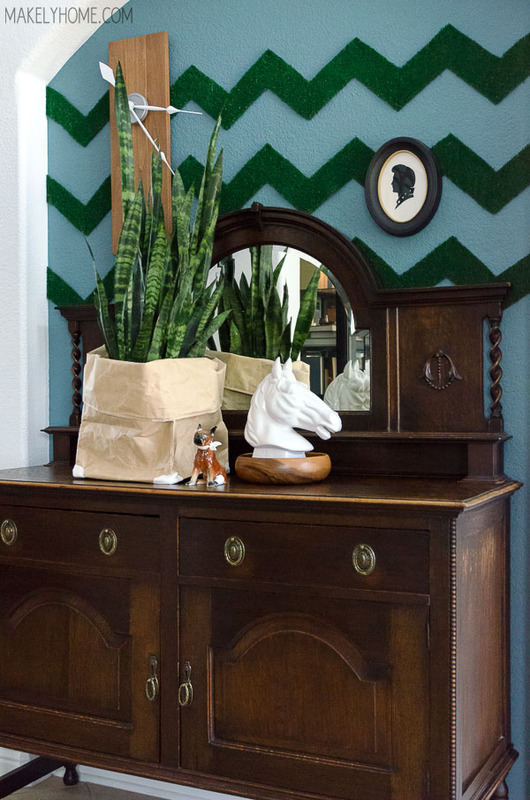 I like how you bring that zigzag pattern inside the home too. 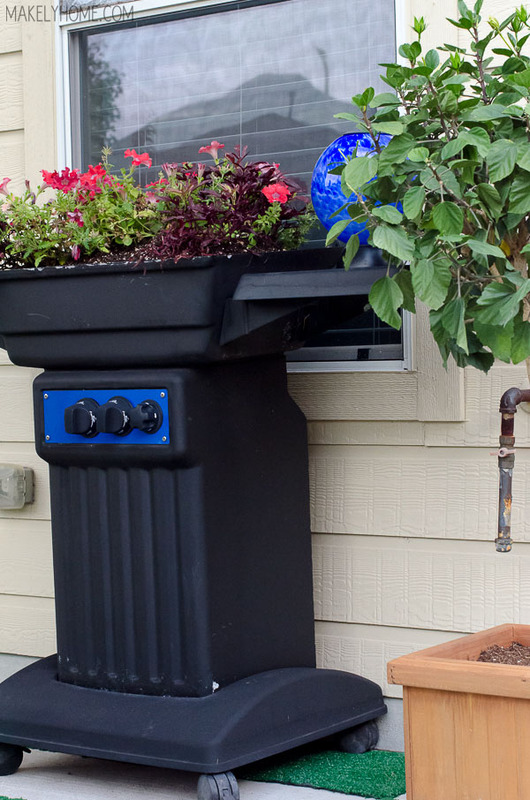 I have a question about the patio with the BBQ Planter. 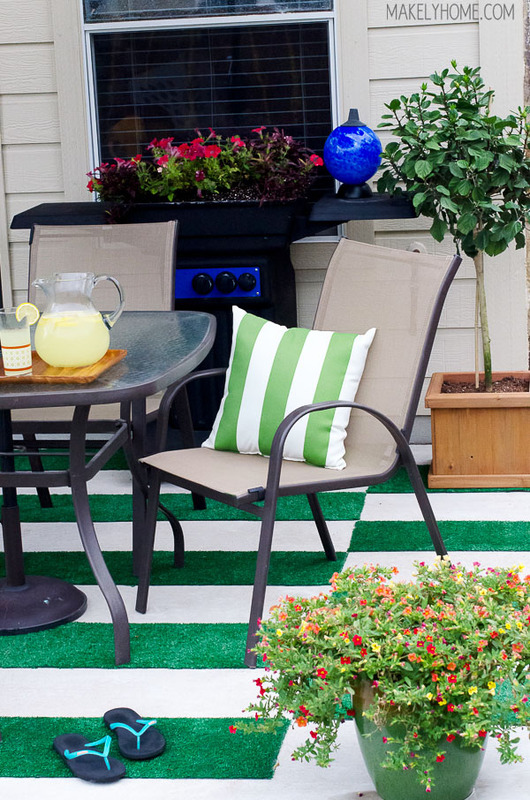 It looks like you have a concrete deck and you cut strips of astro turf in squares and staggered them for a tile look, is that true? How did you get the squares cut so uniformly and square and how did you get them to stick throughout traffic and the heat of summer? Great idea, I just don’t know if I would have much success carrying it out. 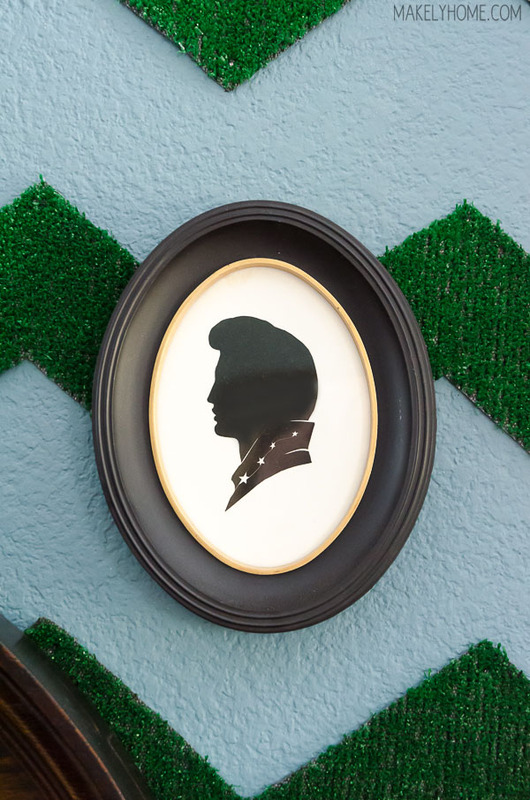 You had me at the Elvis silhouette ! 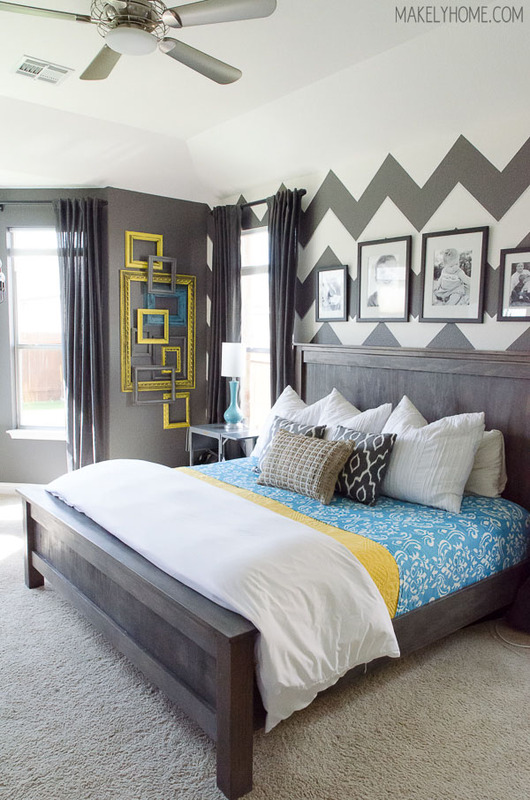 Love your chevron walls! Your home is gorgeous!